Rice engineers pose with their car seat accessory, Infant SOS. Credit: Jeff Fitlow. It's a tragedy that happens multiple times every year: An average of 38 children die each year after being left in hot cars. Five recent Rice University graduates have designed a new car seat accessory that can not only protect infants accidentally left in hot cars but can also notify caregivers and emergency personnel. 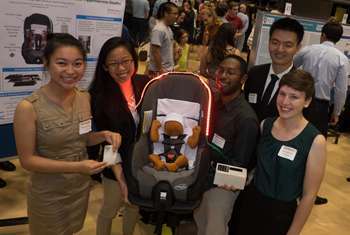 Audrey Clayton, Rachel Wang, Jason Fang, Ralph LaFrance and Ge You, who graduated from Rice May 16, spent the past year working at Rice's Oshman Engineering Design Kitchen to develop Infant SOS, a car seat accessory to protect infants left in potentially lethal hot cars. The device is fitted into standard car seats and can issue auditory, visual and text alerts when it senses that the infant is in danger. It also features a passive cooling system designed to keep an infant's core temperature below a critical point (heat stroke begins at 104 degrees Fahrenheit) until emergency responders arrive. Clayton said it's no surprise that most of the tragic incidents involving children left in cars occur in the summer months. "It works out to about a child every two to three days, which is a shocking statistic," she said. "Our hope is that our device can prevent this from happening." The alert system is the accessory's primary means of protection and includes sensors to detect if the car is moving, if the child is still in the seat and if the temperature in the vehicle begins to rise. 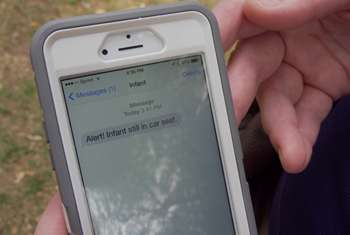 If the device detects that the car is parked with the child still in its seat, the device's alert responses will be activated after 30 seconds, beginning with visual and auditory alerts. 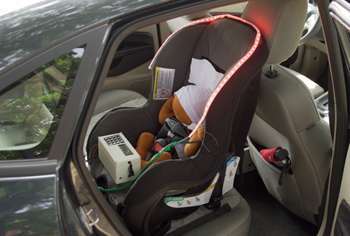 The visual alert is a flashing row of red LED lights that lines the car seat and the audio alert is an alarm. After five minutes, if the infant has not been removed from the seat, text alerts are sent out. The device can be programmed to send texting alerts to up to 10 people, including emergency responders. "The system is designed to do as much as it can to get to as many people as possible," Fang said. "And hopefully, passersby can see the LED lights and can respond as well." In case of delayed responses, the cooling system can act as an emergency backup to extend the infant's chance of survival. A heat-triggered material acts as a main heat absorber to keep the infant's core temperature at a safe level for as long as possible. "The benefit of our project is not only the alert system, but also the cooling system," Wang said. "The best way to keep a child alive is to completely remove them from the car seat inside a hot car. However, if the parents do not immediately return to the car, we need to ensure that the baby stays cool until help arrives. The device actually absorbs heat from the environment and the baby and is able to keep the baby cool longer, giving extra time for the parent to return or for someone to notice the flashing lights and see that a baby is trapped in the car." The Infant SOS device installed in a car with visual alerts flashing. Credit: Brandon Martin. The project was funded by Dr. Susan Baldwin '82 through her company, Mamoru Enterprises LLC. She proposed the senior design project after learning that the child of one of her patients had nearly died in an overheated car. A past Design Kitchen team originally developed the project in fall 2013, but the current team has worked to include the cooling system and improve the alert component. Another team will work to streamline the device's alert system during the 2015-2016 academic year. The students' ultimate goal is to make the removable accessory easy to use and accessible to a large market. The students expect the device to cost approximately $150. "The reason I chose engineering in the first place is to be able to make a difference and be able to build a product that would be able to help people," Wang said. "I really appreciate the opportunity of being able to work on something that could potentially save infant lives in the future."